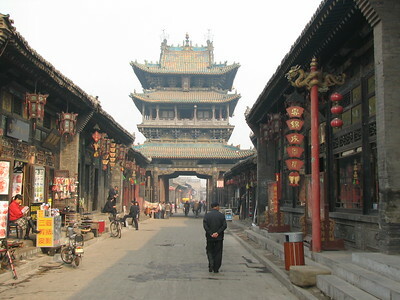 Ping Yao is an integral and well-preserved ancient Chinese city from the Ming and Qing dynasties (1368-1911). Its urban plan and defensive line have not significantly changed since. It is now renowned for its well-preserved ancient city wall and the imposing buildings associated with banking, for which Ping Yao was the major centre for the whole of China in the 19th and early 20th centuries. There are two sides to Ping Yao. I stayed there for 1.5 days and at first I noticed mainly its poor living conditions. When you look down at the town from its city walls you see a lot of dust and dirt and cramped housing. There are quite a number of public toilets, from which I deduct that many houses don't have private bathrooms. In my first half hour roaming around the city's backstreets I also came across two men peeing in the street (and they were neither drunk nor beggars). Later on I began visiting the courtyard buildings and temples that are now in use as museums. That is where all the wealth was. Behind a simple looking entrance there are vast complexes. The bank, the service where once could hire armed bodyguards, the judicial court with its prison and torture instrumens, the chamber of commerce and the residence of the founder of the first bank, Lei Lutai. There's even a shrine where you can pray to the God of Wealth! There are many guesthouses with a traditional courtyard setting where you can spend the night. I did so at Yide hotel, situated in the 18th century house of tradesman. This is well recommended: it's a welcome change to sleep in a bare room on the ground floor where fresh air and neighbourhood noises come in, after all those highrise Chinese business hotels that look the same. I even enjoyed the bean bag pillow and slept like a log. My third world heritage site of Shanxi trip and also my final destination was Ping Yao, the well preserved ancient Chinese city which was the important financial and trade center of Chinese Empire during Ming and Qing dynasties and clearly my favorite place of this short but wonderful journey. I was arrived Ping Yao at night, at first sight, new Ping Yao offered me a typical dusty Chinese town with unplanned closing road which made my chauffer quite frustrated with the chaotic traffic. After half an hour, the city wall of old Ping Yao was appeared in front of me. The city wall of Ping Yao, in my opinion, was one of the most perfect city walls I have ever seen in Asia; the moat and wall turrets were just remarkable, smaller but far better than the city wall of Xi'an. I stayed in a traditional hotel called Yi De, which was once the residence complex of Hou family, sleeping in this hotel was kind of experience as I sleep on a traditional bed in the small ancient room with modern bath surrounding the beautiful courtyard. Not only the hotel I was impressed, the whole city of Ping Yao was unbelievable to be existed in the modern day China. Walking in Ping Yao was liked walking in the old Chinese movie scenes; the city was full of beautiful Ming Qing traditional courtyard houses, and along the main roads were lively old shop houses that now transformed to be hotels, restaurants and souvenir shops selling Ping Yao style roast beef and tasty Shanxi vinegar. As I mentioned Ping Yao was an important financial and trade center, there were an ancient bank, insurance company and merchants houses that now opened as museums. Visiting the city was free of charge, but for museums, city wall and temples, 120 Yuan was the price for the whole package. My favorite place was the city tower located in the middle of the city, which was not included in the city ticket. 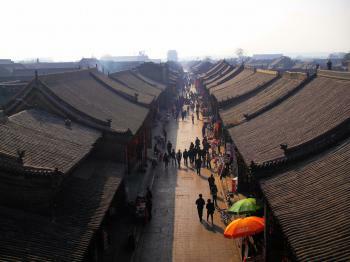 For 5 Yuan, the tower offered you one of best and dreamy view of this city with sea of tile roofs under your feet. Ping Yao was really touristy, but the city was able to keep its original characteristics, local people still live in the old city with their non tourism businesses. I highly recommended visiting small but lively morning market near the old government buildings and buy delicious local snacks freshly made by old friendly locals or vegetable or fruit in horse draw carts. I also interested in city policy, the notable one was toilet, as ancient Chinese houses had no toilet, instead of put modern one in every house which may destroy ancient house elements, local authority chose to build many public toilets in many parts of city for people to use. Ping Yao gave me many nice memories from its people, food, and architecture and also gave me a good example of which direction ancient Asian city should be preserved. Visiting Ping Yao was truly a great time in China and was another place which deservedly to be a world heritage site. I went to Ping Yao in May 2005 as a field trip from my International school in Beijing. It was realy exicting to find out how the poor half of China lives. It was fun expiriancing the ancient cultures of China. Is was fun finding out how the old bank system is China worked as there were many banks in Ping Yao. It was truly an amazing experiance! We went with Grandmaster Huang, Chien Liang, of Baltimore, Maryland, with a group of 30 students. This city was phenomenal, very beautiful and striking with its wall surrounding the entire city. We were warmly received, had fun shopping, and watched a 14th century trial, with the accused being punished. We also saw part of an opera and many artifacts in a museum setting. One of the best days of our trip. During my visit to Ping Yao in 2000, I learned it had just been added to the World Heritage Site-list. It was until then mostly visited by Chinese tourists. In this town I experienced the feel of 'ancient'-China. Hardly any foreign tourists and a walled town-life which seemed to haven't changed during the last century. Bikes were the main transportation within the wall. It is my favourite Chinese town! I visited Ping Yao in August of 2002. I was impressed with its factual existence in the same form as a typical ancient Chinese town. The vehicle traffic inside the wall was virtually nonexistence. I saw no building taller than two stories. I was able to walk around the city on top of the city wall. I was also able to observe construction in the ancient style as properties were being refurbished. It was definitely worth the visit.